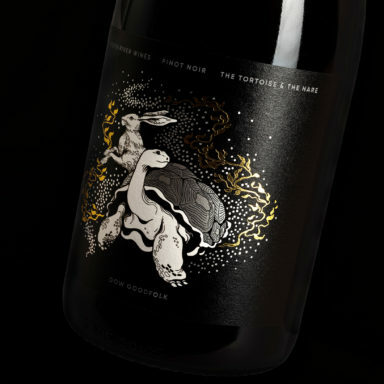 Welcome to Hot New Things 2019 – an opportunity to profile a selection of the top design graduates coming out of our tertiary institutions. This week, we speak with collaborative duo Rachel Bolt and Katie McKenzie from Massey University. You completed your full time studies at the end of 2018. Can you tell us what your final year’s project was about and what you focussed on? 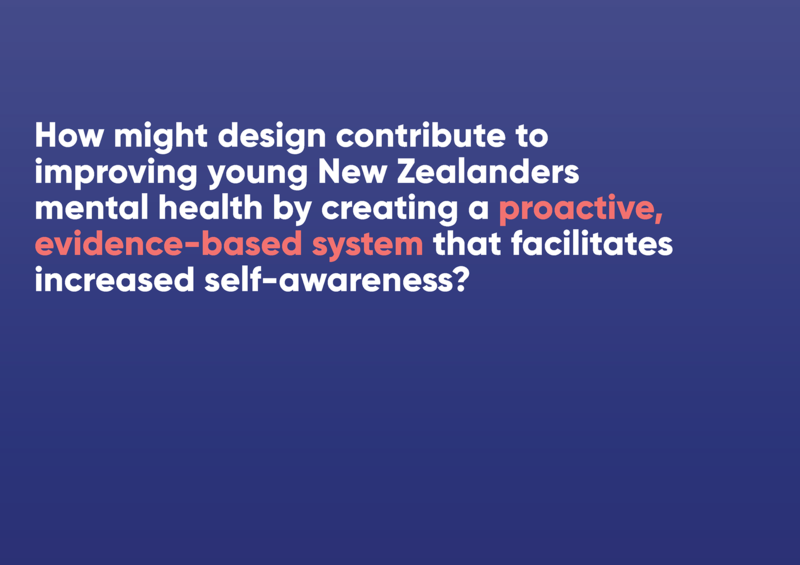 Our honours project focused on how design could contribute to improving the mental health of young New Zealanders through a proactive system and service. 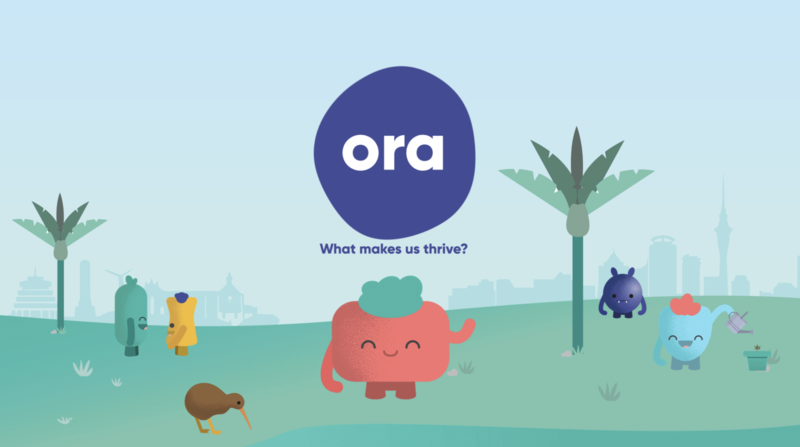 We created Ora, a digital platform which takes a proactive approach by making the concept of wellbeing applicable to everyday life, building self-awareness and equipping our audience with evidence-based tools they need to be resilient. How has what you’ve recently been working on influenced your design process, and what momentum does it bring to your practice? RB: We used service, transition and user experience design processes throughout our project. Through designing Ora, I’m taking skills that help to create accessible, purposeful, intuitive and engaging experiences. KM: By creating Ora using a user-centred design approach, our design process was very iterative and open to change/pivot based on the insights we got from our users. Some of the methods and techniques we used were new to me, so it will be great to now use these in future projects. What were some of your most exciting discoveries? When we were exploring ways to engage our audience we discovered that they reacted really well to the use of the garden analogy. 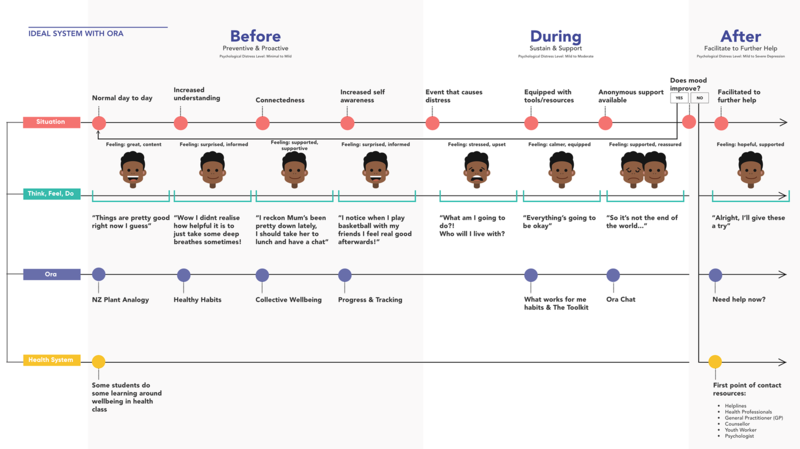 This then allowed us to delve deeper and explore how we could make it more engaging and interactive, so that’s when we added the gamification aspect. And also some of the challenges along the way? Throughout our process, we were faced with many challenges. One was our ability to test with young New Zealanders. If we had more time we would have liked to have worked with a lot more young people from different cultures and backgrounds. We acknowledge that we are not psychologists and would have liked to work more alongside health professionals with incorporating evidence-based therapies. This is also a future opportunity to develop Ora further with a team of health professionals. We chose a digital platform due to accessibility. However, not all young New Zealanders have access to a digital device. Going forward, we would create more physical touchpoints to increase inclusivity. This would cater to more hand on learners as well. What did you love doing most? RB: My favourite part was diving into the problem to explore the current system, who we needed to design for and why through design processes. I also loved exploring the different ways we could make Ora best work for young New Zealanders with Katie and then seeing it come to life! KM: I loved being able to dabble in new programs like Sketch and Adobe XD for our prototyping and also loved the collaboration aspect. We were able to constantly bounce off each other which lead to a more rounded and thought out solution. Where do you go to find inspiration (websites, resources, designers, etc)? RB: Surprisingly Twitter, it’s a great place to connect with others from the healthcare and design industry! I also go to Pinterest, Behance and Dribbble. KM: Definitely Behance and Dribbble would be my main sources of inspiration when it comes to websites, but I also take a lot of inspiration from my peers at uni. Why did you choose to study at your design school, and what do you feel you can take away now that you’ve completed your course? RB: Art and Design is something I’ve always thrived at, so for me, it was a no-brainer to keep studying it. I came to Massey liking collage, painting and drawing and am leaving taking a mind full of knowledge around applying design processes to complex problems in order to improve the lives of others. KM: I chose to study at Massey because of its great reputation for design and because it was based in Wellington, where I’m from. I came to uni expecting to learn about branding and creating websites and posters etc but left having learnt there’s so much more to design than aesthetics. I feel I can now apply design thinking to so many different complex problems and situations that it’s been an invaluable experience. Where to next for you? What does 2019 hold? RB: I’m really excited to be joining the awesome team at Springload in Wellington! Springload is an agency that creates people-driven digital experiences. 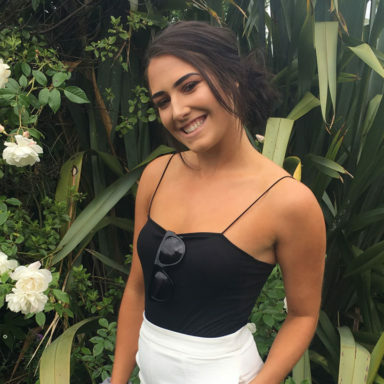 KM: I’m really lucky to be joining the digital design team at BNZ as a summer intern! So that’s a very exciting opportunity and one that I’m sure I’ll learn a lot from that will also open up different avenues for me.